For detailed information about dimensions and characteristics of the products, please refer to the data sheets. * The application is made in accordance with the project developed to comply with lighting requirements of each client. Lumino Energy Solutions, in partnership with Genesys Global, provides revolutionary lighting solutions through an innovative energy efficiency technology, the gHID ballast. The patented gHID solution, developed by Genesys Global, is transforming the global lighting landscape: it provides best-in-class energy efficiency savings for virtually any existing high intensity discharge (HID) infrastructure. The innovative design of the gHID ballast allows it to operate many brands and types of HID lamps, extend the rated life of the lamp by over 2 times its rated life, and provide a whiter, brighter light (Scotopic) than a standard magnetic ballast. This high quality of light produced by the gHID ballast allows the use of a much lower wattage lamp replacement which in turns saves the user 70% + in energy usage. The ballast is designed to fit in most existing high bay and outdoor light fixtures eliminating the need for additional infrastructure costs. This provides a true low cost retrofit. Other popular energy savings lighting solutions require the entire fixture to be replaced and in many cases additional light fixtures are required to provide adequate light quality. With 40 years experience in analog design and lighting applications, our engineering team designed this ballast with a very high frequency pure sign wave output to the lamp which is able to drive more energy in the light spectrum than lower frequency devices. This creates a brighter and whiter light output versus low-frequency electronic ballasts, saving up to 70% in energy to produce similar lighting. The gHID easily meets the most strenuous common FCC type standards without excessive reliance on and heating of filter components. In addition, it complies with all European EMC requirements. It was also tested for safety and received UL Certification. The gHID has been rigorously tested and is now in service in a variety of applications worldwide, including parking lots, roadways, industrial facilities, retail and airports. The gHID large-scale adoption is quick to be implemented. The gHID was designed to work in any environment. High performance product manufactured by Emerson. 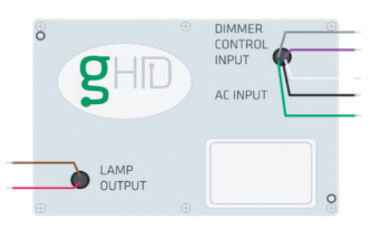 The gHID optimizes existing HID lighting facilities. And also reduces maintenance costs, extending lamp and ballast life cycle. The financial return (payback) of gHID is faster than that obtained with other technologies. In addition to energy efficiency, the gHID also provides ongoing benefits with reduced maintenance costs. Importantly, Lumino Energy Solutions can finance the purchase of gHID through sharing the economy generated. The gHID is a fast and economical solution for our clients to reach their large-scale cost reduction goals. High intensity discharge (HID) lighting, by definition, has high levels of electrical discharge, to create an electrical arc in the bulb, which emits light. Supplying the power to create, drive, and sustain this arc reliably is no easy feat. The device that does this is called a ballast. It is a complex circuit made up of many components to accomplish specific tasks. Types of Ballast: There are mainly three types of ballasts: magnetic, electronic and hybrid. Magnetic and hybrid ballasts employ a copper coil wound on a magnetic core as their essential components, while electronic ballasts use solid state electronic circuitry to provide the proper operating electrical conditions to the connected lamps. Magnetic ballasts have been the primary ballast used in HID lighting for decades. As lighting and electronic technology has become more sophisticated the magnetic ballast has become less optimal for HID lighting. Yet magnetic ballasts are still widely used. There are millions of HID lights out there in the world. We aim to have gHID in all of them.